Beautiful presentation Khalid and your bread looks great as always. I was wondering how your bread would react after 3 days. Sounds like it's almost time to get a bigger oven :). Thanks for the update and I'm happy you are selling out. How goes the apprenticeship search? It is high time that i upgrade my oven capacity, now that i see how fresh bread sells. As to apprenticeship, i've stalled the opportunity until i could finish the inheritance thing. The bread looks great as always. Keep selling out and the new larger oven will be yours! Well done and happy baking. I love your presentation, Khalid. It's clean and simple, with the focus on the bread itself, highly approachable, which will invite questions and subsequent purchases! They all look wonderful, but I can see (smell) how the roasted garlic loaves will attract attention. Thanks, Cathy! Presentation is crucial, and it can make all the difference. The roasted garlic was fresh and aromatic. All bread should have been as fresh. They are beautiful, love the scoring. You always have such lovely presentation, very cool that you sold out. Hope all is going well with your endeavours, keep us posted! Thanks, Kiseger! That is kind of you. breads but selling 3-day old bread? That's seems kinda . . . unusual, at least to me. I appreciate the oven size is a restriction but you say 20 loaves. If you can bake 2 loaves at a time then that's just 5hrs of bake time end-to-end. Seems odd that you need to start that 3 days in advance. Presumably it's do to with balancing dough mixing, bulk ferment times and how much free time you have for this venture? I'm not criticising just trying to understand the factors you're having to balance. My oven can bake 6 loaves at a time, each 500-600g. 3 on the top stone, and 3 on the bottom. However, i can only bake when i get home from work, so 6 loaves is all i can bake during a weekday. Thereford, In order to bake 20 loaves , i have to bake some in advance and freeze them when possible. You just have to smile and nod. What are these people thinking? You don't use commercial yeast, you use natural air born yeasts. Or yeasts from skins of a fruit. You and I we all understand. Our city has a wonderful bakery called Turtle Bakery. Why the odd name? Because the baker used natural grape skin yeasts and it took days to raise the dough, slowly like a turtle, so, she called it Turtle Bakery. Hi, StuartYes, you are right. Yes, you are right.. Smile and nod. The customer was probably avoiding commercial yeasted bread, and was happy to find an alternative. Lovely display of your 'wares'. Thanks for the update on how your business is going. It can get somewhat hectic on the eve of the market day, but it all ends well. Very nice bread and excellent presentation. Seems like you might have too increase your through put capacity to keep up with the increasing demand. Yes and upgrade is in the cards now. Your bread making skills is really good, and you're posting some really attractive loaves. Keep it up! You should be extolling the virtues of the bread for its toasting qualities, regardless of its hardening with time the toast is always outstanding no matter whether it has a really fresh home grown chickens egg lightly poached on top or as a bruschetta cheese on toast or fig jam, If mine lasts a week it's always devoured. What are oven prices like in Dubai? i know that when Varda was ready to buy her new oven and she asked about the new Unox ovens that we had recently purchased at the college, the same thing in America was under the Cadco label and a whole lot cheaper too. I will promote the virtues of a sourdough bread more often verbally, as opposed the printed handouts i prepared and kept on the side. My wife has suggested i bring along my tiny toaster to the market and prepare fresh toast. I think with your advice, i'm leaning more now towards the idea. Thanks Derek! As to oven prices in Dubai, i've searced for the brand UNOX, and found a dealer, but they are quite expensive. The price of convection oven with steam from other italian brands run in the price range between $2000 and $5000 depending on the make and the number of racks. a 7 rack convection oven costs in the upwards of 5000$ US which is suitable for a home useage. I'm very happy to read that you sold out. It ain't easy baking wholesome bread for the community, but it's just so darn satisfying, isn't it? And I'm not surprised that your breads lost some of its eating quality overtime. I noticed the same thing with my breads when scaled to 500g. 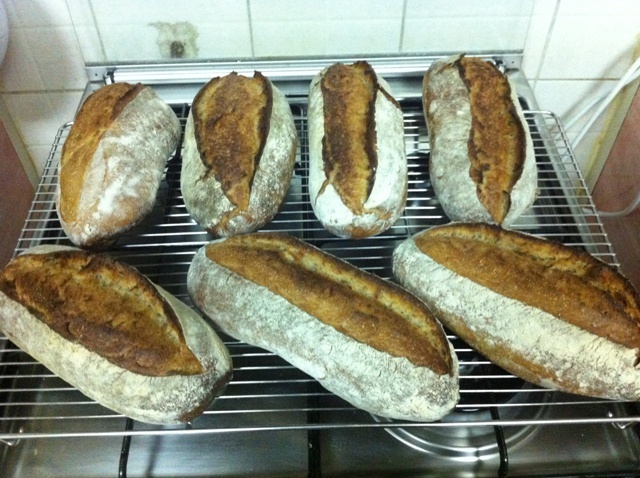 One solution I found was baking larger loaves, mainly 1 kg loaves, and sell them to customers as either half or whole. If they want half a loaf, I cut it in front of them, paper bag it, and they walk away happy. Suffice it to say, the eating quality of my breads is much better when they're larger (not as chewy and firm, even after a day or two at room temperature). I hope this bit of info helps. I agree with Zita - small loaves just don't cut it. My standard is 700g which I think is the smallest that the loaves hold up for awhile and also better ratio of crumb to crust. People like the small loaves (I used to make 500g) because they want to try something and not have too much of it, but then they complain about the keeping qualities. Yes, Zita, baking real bread for the public is very satisfying and fulfilling, as is nutritious. I've noticed you scale your bread at 1000g on your facebook page. Thanks for the advice, Zita. Not too long ago, I used to scale my loaves @ 650 each for the market, but the table rent went up, so I thought of reducing the size of my loaves. BAD idea, isn't it? doesn't sound ethical either. I think that asking customers to pay slightly more for each loaf would be better than reducing the size and compromising the shelf life and eating quality. Also, I've noticed that slender batards stale faster than plump onesm or boule shape. 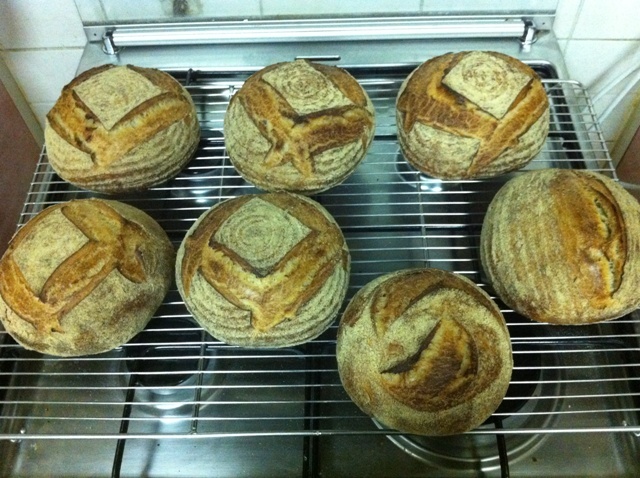 I'm thinking of making thicker tapered batards or boules for the market. Making large loaves of 1 kg each sounds so appealing to me , and i'll have to try that too. Thanks for the input, Zita :) and I wish you too a continued success. I just got back from my weekend market. The last few days were a blur of getting ready, so I'm glad I caught your post. Glad you did well. I'm very familiar with the issues of freshness vs saving vs freezing and the space issues, and constantly trying to juggle to do a better job. I try to stage things so that for instance I bake Borodinskies on Thursday as I know they will taste great by Saturday and then more fragile things on Friday, which then get wrapped in thick flour bags. Finally baguettes and bagels very early on the morning of. 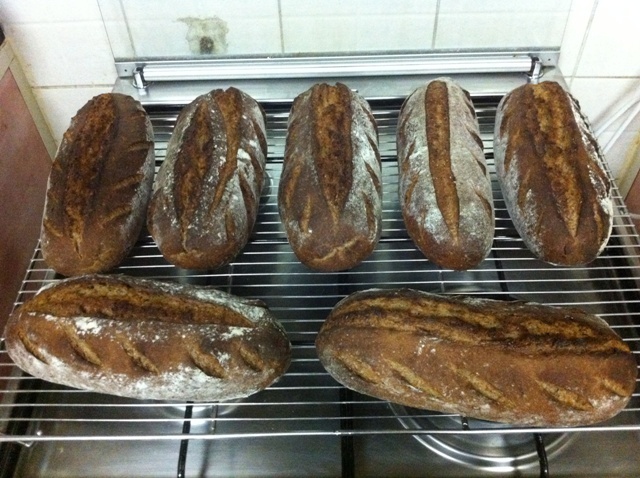 I find that certain things freeze so well that they can be baked a few days earlier - flaxseed rye is one of these. Other things just don't taste right after freezing. But altogether it is hard to retrofit a home kitchen to the purpose. As always your bread looks wonderful! Interesting. I used to stage my breads in a similar fashion, too: Whole ryes, then whole wheat/ multigrain, and finally rustic whites with /olive/garlic. I haven't tried baking on the Market day, as I'm often worn out by the last 3 days of continuous baking. Thanks for the input, Varda :) Much appreciated. Good luck to you too.